Ran the Cherahola skyway today. What a road! Cherohala skyway is one of my favorites, the big sweepers really contrast with the twisties of the Dragon. I look forward to running my new ride up there after PPF install. Yeah, love love love the Skyway. And this time of year, and assuming no ice, the best road in the East. Where the Dragon is 30 mph, the Skyway is double that, at least, with straights to stretch the legs! Don't really get the criticism of the 7MT in the T and, to a lesser extent, other 991.2 Carrera-line cars. Is it as easy/fun to use as the 6MT in a GT3? No, but it is not by any means bad or even mediocre by the standards of gearboxes from other manufacturers (or, for that matter, Porsche itself in the not-so-distant past)—and neither the 991.2 GT3 6MT nor the 991.2 Carrera 7MT seem to me quite as sweet in use as the 6MT in the 981 GT4. I've spent a lot of time with both. 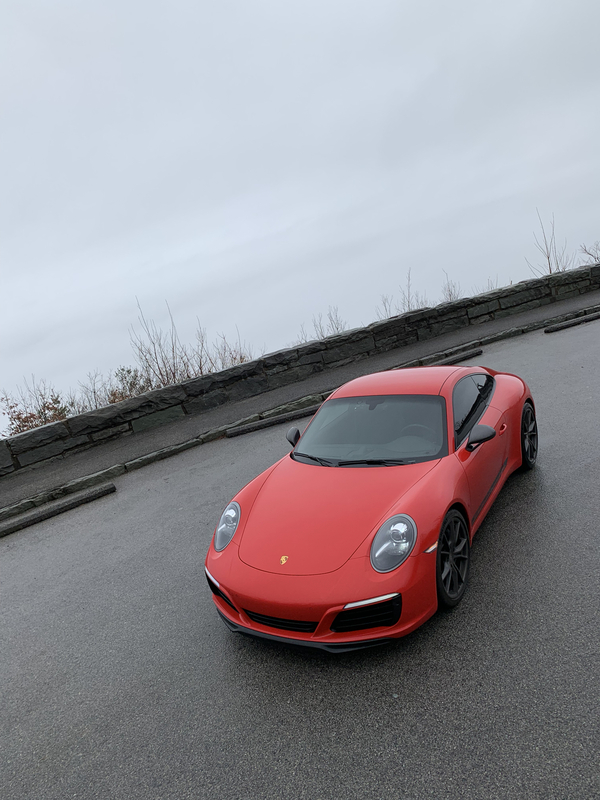 After 14,000 miles, I moved from a 2016 GT4 to a 2018 Carrera and found its 7MT better to shift than those in the early press 991.2 cars...to the point that I wasn't so sure the GT4 shifter was significantly better. Too many gates? I can see that criticism 15,000~ miles later, but that has yet to present a problem for me. As for shifting into 7th on a long freeway slog? It's transformative. Running the 3.0 at 1800-2200~ rpm sure beats running the GT4's 3.8 at 3200-3500+ rpm for long stretches of interstate. It's like getting a second car in one...and I find the Carrera's lower gear stack lot nicer than the GT4's on back roads, with the T's that bit better thanks to the slightly lower effective final drive ratio. YMMV, but I think the Carrera T is sorely underrated. The Carrera T is a great driver's car especially on the open back roads, etc.... and it can hold its own on the track too even against more powerful cars. I thought that the GT3 touring shifter was too light. Reminded me of a normal car, something like a civic. It also didn't snap to center/3rd strongly enough, to to the point that when going from 2nd to 3rd I hit the gate between 3rd and 5th, something that's happened to me in a 987. In my experience, the 911 T shifter had better self centering and I never missed a shift. With everything you feel and touch (seats, steering, shifter) I thought the 911 T experience was waaaay closer to a GT3 experience than the price difference suggests (not so with sound and brakes). And you can buy one at a discount instead of with an ADM. Drove my first Carrera 7MT to SFO to fly to the Carrera T/GT3 Touring event in South of France, and found the only obvious differences were the shifter (notably nicer), cabin sound (a bit nicer), and LSD (nice, but the rear-engined Carrera rarely has issues with putting power down). SPASM didn't seem as different from PASM as it had in the 991.1 era...as though it's a matter of aesthetics more than substantive tuning differences—something an engineer confirmed as part of the 991.1 > 991.2 progression, making the standard setup keener and the sport setup more livable according to customer feedback. The T seemed to me to be a marketing move with a goofy name, albeit a very nice package. It wasn't until we took a Carrera 7MT and a Carrera T 7MT for a 700~mile loop test for 000 that the Carrera T set itself apart, and its advantages were obvious albeit still pretty subtle. It was a fun test, and while one of us preferred the T, two of us actually preferred the Carrera (but not for reasons that most people would value). Thus, the T "won"—but not by much. I thought that the GT3 touring shifter was too light. Reminded me of a normal car, something like a civic. It also didn't snap to center/3rd strongly enough, to to the point that when going from 2nd to 3rd I hit the gate between 3rd and 5th, something that's happened to me in a 987. In my experience, the 911 T shifter had better self centering and I never missed a shift. ^ Interesting feedback. Love observations of subtleties like this. Need to look for/at that next time I am in a GT3 6MT. With everything you feel and touch (seats, steering, shifter) I thought the 911 T experience was waaaay closer to a GT3 experience than the price difference suggests (not so with sound and brakes). And you can buy one at a discount instead of with an ADM.
As for what you've got bolded? Just as I view Guards Red as the new PTS, I've wondered if the CT is in some ways the new GT—a driver's car for those who don't much care if there's "something better/faster" out there, and will use the car without guilt. It's no GT3, but it's pretty appealing as its own ball of wax and a very complete, all-uses 911.
horses for courses, but I find the GT3 Touring shifter too firm going into 5th and 6th. It really takes some effort to get it over to that side of the gate and I can see how you could hit 3rd trying to downshift to 5th if you were not experienced in it. I also think it is too short and too low relative to the boot (and the console is too high)— these are the same issues in the T and the console being too high is all 991. I agree with stout that 7th for Highway is good. I find it annoying to cruise at 3k rpm in my GT3. Last edited by evilfij; 01-14-2019 at 05:36 PM. Don't really get the criticism of the 7MT in the T.
I don't either. I love the short shifter and shorter low gearing in the Carrera T 7MT. I almost bought a T, but as guy with the means for a single 911, I went with the GT3. I felt like I would always have the regret of not getting the GT3 if I went with the T.
You chose well. The 4.0 flat six is 250 GTO V12 good, despite half the cylinders. Maybe better. A real masterpiece...and the rest of the car ain't bad either. Fortunately I am able to pair my T with a GT car, and sincerely hope that I'll always have the means to do that. However, if I had to go to one 911 (Gasp!) it would be the T, hands down, no contest. I've had every machination of 991 GT car there is, and as we know they are incredible cars. However, what the T does far better is the essence of the 911. Not just livable, but an absolute joy to drive around town, even more fun in the mountains, capable on the track. I thought the T was a 60-90 day hold while the next GT arrives, but the damn car flipped my sports car priorities upside down. I instantly connected to the car and immediately started thinking I may never sell this one. Plus my T "only" set me back $98k. Where the T falls short would be on the track. I've never tracked it... may do it at some point just to see what it's like. With the base Carrera brakes, lower power, and much lower overall grip, I don't know how I'd feel about it. If I was going to the track regularly, a GT would make a ton more sense. But, the majority of my driving is around town and into the mountains, where the T shines. I was talking to the new head of Sports Cars for PCNA at the 992 preview event at PEC a couple weeks ago... We discussed the fact that with such low volumes (far lower than even GT2RS) and the fact that the T is the last narrow body "special" 911, it ironically could be the future classic. I certainly won't drive it like a classic - about to cross 4000 miles in 3 months of ownership. I sat in the 992 at PEC, and felt they will not be able to extract the charm of the T out of it... minimalist, analog, pure. I don't see it happening. I know as cofounder of Smokies and on a GT board this seems like blasphemy, but go drive a T with a manual, RAS and 4 ways (nothing else needed) and try to tell me it's not hilariously fun. The car is far more than the sum of its parts - it seems like a parts bin special, but it is such a great combo of GT elements, everyday drivability and unique packaging that it just never gets old. ^ Thanks for the thoughts sgroer - I bought my T for various reasons, primarily nostalgic as my Dad's 1st 911 was a 1973T that I grew up with, but also because although I'd always loved the 991 - coming from an analog 993, I didn't connect with the non-GT cars. 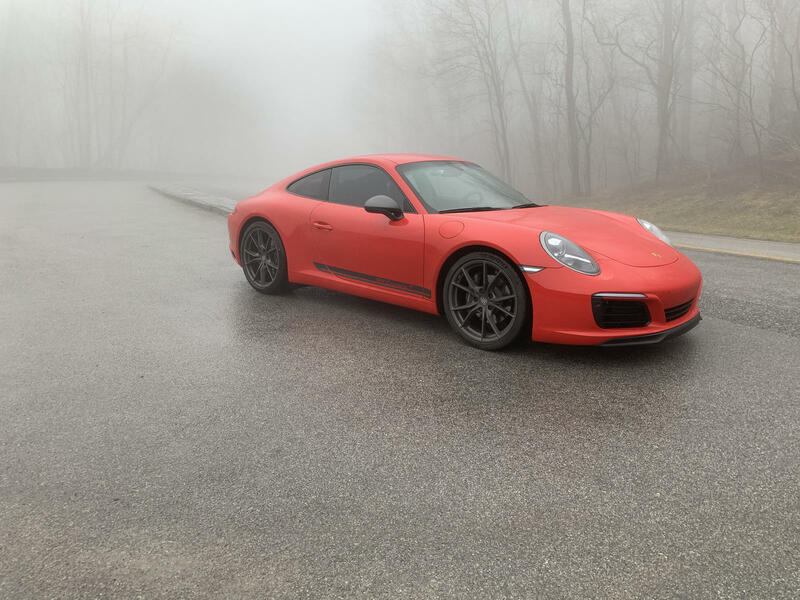 While I was finalizing my order late last year, I drove several GT3s thanks to local Porsche friends and I felt safe that my "out" if I didn't bond with Carrera T was to trade up. Within the 1st 1000 miles I knew this car was a keeper. In a lot of respects, it was the exact same feeling I had 18 years ago when I bought the 993 (used) - The revised final-drive ratio in the 7MT, while seemingly a small change, completely opens up the character of the 3.0TT compared to the base car. To the point that when I drive the GT3 and CT back to back, it's honestly a toss-up on which engine I like better - the high-strung 4.0 is glorious but feels cramped in normal city driving. The 3.0TT has less aural magic (but it does have some good noise at 7.5K!) - but is just far better on the street. And I'm not sure how to describe this, but the suspension tuning on the CT is just perfectly executed - it feels light and darty at speed in the twisties, and stable / solid on the highway (my T has RAS). The GT3 is very different - it's clearly tuned more towards track work - and while I hesitate to use the word fatiguing (because it's not), it's just not as good for daily use on typical US roads. The CT and GT3 are the cars that speak to me - but since I can only have one to do it all, it's the Carrera T, and no regrets. They are both outstanding cars! And for those wondering - Over they years, I'd had upgraded my 993 setup to Euro RS spec minus the 3.8. It was fantastic, but suffered the same issue - not as usable (really was fatiguing) on public roads - and I wasn't driving it much as a result. The best cars are the ones you drive! Great post and I agree with you. Happy to have my GT3 for the track but almost always choose my T for the road and if I could only have one would keep my T. I would have never thought this possible before driving -- and soon thereafter buying -- the Carrera T.
I am really facinated by the love for the T. What amazes me most is that the 991.2 when it came out caught a lot of flak for being turbo and no one seems to care with the T. I am also surprised how few people ordered LWB which, to me, was the one option that really set the T apart from a similar spec S (other than cost savings).